The Crosby A-330 Clevis Grab Hooks are actually made from Grade 80 alloy steel, but are not rated for use with overhead lifting chains unless proof-tested per ANSI B30.9c. They are a heavy-duty hook, however, and work well for tie down chain systems. They offer quick and easy assembly, a 4:1 design factor and high Working Load Limits. 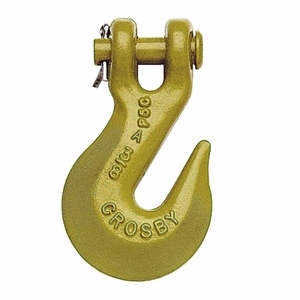 Don't use this hook; instead, use the A-1338 Grade 100 Clevis Grab Hook, which is suitable for load securement, overhead lifting and practically anything else you can think of.